Energy Nominee Ernest Moniz Criticized for Backing Fracking & Nuclear Power; Ties to BP, GE, Saudis | Democracy Now! director of the Public Accountability Initiative, a nonprofit research organization focused on corporate and government accountability. The group recently published a report called “Industry Partner or Industry Puppet? How MIT’s Influential Study of Fracking Was Authored, Funded, and Released by Oil and Gas Industry Insiders.” Connor is also the co-founder of LittleSis.org, which compiles data on over 40,000 people and organizations with special influence over the political process, including politicians, corporate executives and lobbyists. AMY GOODMAN: President Obama’s pick to become the nation’s next energy secretary is drawing criticism for his deep ties to the fossil fuel, fracking and nuclear industry. Obama nominated MIT Professor Ernest Moniz last month to replace outgoing Energy Secretary Steven Chu. PRESIDENT BARACK OBAMA: I could not be more grateful to Steve for the incredible contribution that he’s made to this country. And now that he’s decided to leave Washington for sunny California, I’m proud to nominate another brilliant scientist to take his place, Mr. Ernie Moniz. So, there’s Ernie right there. Now, the good news is that Ernie already knows his way around the Department of Energy. He is a physicist by training, but he also served as undersecretary of energy under President Clinton. Since then, he has directed MIT’s Energy Initiative, which brings together prominent thinkers and energy companies to develop the technologies that can lead us to more energy independence and also to new jobs. Most importantly, Ernie knows that we can produce more energy and grow our economy while still taking care of our air, our water and our climate. AMY GOODMAN: The Senate Energy and Natural Resources Committee is scheduled to hold a hearing on Ernest Moniz’s nomination as energy secretary on April 9th. Reactions to his nomination has split the environmental community. Advocacy groups such as Public Citizen and Food & Water Watch are campaigning against his nomination, but the Natural Resources Defense Council has praised his work on advancing clean energy based on efficiency and renewable power. Much of the criticism of Moniz centers on his extensive ties to industry. He has served on advisory boards for oil giant BP and General Electric and was a trustee of the King Abdullah Petroleum Studies and Research Center, a Saudi Aramco-backed nonprofit organization. In 2011, Moniz was the chief author of an influential study for MIT on the future of natural gas. According to a new report by the Public Accountability Initiative, Moniz failed to disclose that he had taken a lucrative position at a pro-drilling firm called ICF International just days before the study was released. We’re joined now by two guests. In New York, Justin Elliott, a reporter at ProPublica, he recently wrote a piece called “Drilling Deeper: The Wealth of Business Connections for Obama’s Energy Pick.” And in Los Angeles, we’re joined by Kevin Connor, director of the Public Accountability Initiative, a nonprofit watchdog group which recently published a report called “Industry Partner or Industry Puppet? How MIT’s Influential Study of Fracking Was Authored, Funded, and Released by Oil and Gas Industry Insiders.” We invited MIT to join us on the show or send a comment to read on air, but we did not receive a response. Kevin Connor, Justin Elliott, we welcome you to Democracy Now! Justin, let’s begin with you. Talk about Ernest Moniz’ record. JUSTIN ELLIOTT: Right, well, I mean, and to some extent, this is kind of the classic revolving door situation. As President Obama mentioned when he nominated him to be energy secretary earlier this month, Moniz was an undersecretary in the department in President Clinton’s second term. After, he went back to MIT, but he also took a number of positions on boards of large energy companies or advisory councils, as you mentioned, that includes BP. It included a uranium enrichment company called USEC. And I think there’s sort of two reasons why this is important. One is, some of these companies do business with the Energy Department and seek contracts and loan guarantees from the department. The other is, people in the environmental community think that this may inform how Ernest Moniz sets research priorities, so people are concerned that he’s—that he’s going to call for research on fossil fuels to the detriment of research on renewables, for example. AMY GOODMAN: BP. Talk about his relationship with BP. JUSTIN ELLIOTT: Well, there’s kind of two prongs on that front. One is, personally, Moniz did a six-year stint—paid, although BP won’t tell me how much—on BP’s science advisory council. It’s not really clear what he did. They don’t—BP doesn’t have to reveal much about it in their public SEC filings. At the same time, BP is one of the main funders of the MIT Energy Initiative. I think they have given—given or pledged a total of $50 million over the past few years. So he’s clearly—he’s clearly close to that company. AMY GOODMAN: And how typical is this for a university professor? JUSTIN ELLIOTT: Well, I think, in the science—in sciences and, in particular, in sort of the energy secretary, it’s increasingly—it’s increasingly common. I mean, Steven Chu, the outgoing energy secretary, who’s also an academic, actually also had close ties to BP. BP had given a bunch of money to Steven Chu’s lab at the University of California, Berkeley, and Chu picked a BP executive to be one of his undersecretaries. And Chu was later involved in the government’s response to the Gulf oil spill. So, I mean, I think this is—this is certainly common if you’re going to be picking an academic who’s involved in energy, and particularly fossil fuel research. AMY GOODMAN: I wanted to turn to comments of the executive director the Natural Resources Defense Council, or NRDC. Earlier this month, Peter Lehner posted on the NRDC blog a “To-Do List for the New Energy Secretary.” In it, he wrote, quote, “As a scientist, Moniz is obviously a firm believer in the power of clean energy technology. [MIT’s Energy Initiative] projects under his tenure included windows that generate electricity, batteries built by viruses, and a biofuel made from yeast. But he also believes that technology must be complemented by policy in order to effect real change. As he said at the Aspen Ideas Festival in 2006, in order to address global warming, we must 'have the will to take more than baby steps. '” NRDC is supporting Moniz’s nomination. JUSTIN ELLIOTT: Right, Amy, and it’s completely true. Moniz has spoken in favor of renewable energy. I mean, I think the best way to sort of interpret his nomination is that he fits in with what Obama has called his “all-of-the-above” energy policy, which is to embrace things like fracking, continued use of oil, nuclear energy, but also develop wind and solar. And I think that that’s where Ernest Moniz is on energy policy. KEVIN CONNOR: Sure. Moniz’s nomination prompted us at the Public Accountability Initiative to take a closer look at an influential study that MIT did on “The Future of Natural Gas,” as it was called, in 2011. It was issued by the Energy Initiative, which Moniz was the director of. And it gave a very pro-gas—put a very pro-gas spin on fracking and shale gas extraction, said that natural gas was a bridge or will be a bridge to a low-carbon future, said that the environmental impacts related to fracking are challenging but manageable, and also endorsed natural gas exports, which is a very industry-friendly position to take. It immediately, you know, prompted some criticism from people who pointed to the fact that the report was actually industry-funded, much like the initiative itself. But it was extremely influential. It was designed to influence policymakers. Moniz testified before Congress on the report. It had immediate impact, as well. And it came at a critical time for the industry, which was facing significant questions about the safety of fracking, the relative environmental impacts of fracking. And we took a closer look at the study and found that beyond just the industry funding of the study, there were significant conflicts of interest that went undisclosed in the report itself and in presentations of the report, and those involved Moniz and several other key authors of the study. So, as it turns out, it was not only just funded by industry, it was also authored by industry representatives. AMY GOODMAN: Kevin Connor, I wanted to turn to a 2011 press conference at the MIT Energy Initiative, where Ernest Moniz introduced the study now under contention, “The Future of Natural Gas.” In his opening remarks, Professor Moniz emphasized the report’s independent of its sponsors and advisers. ERNEST MONIZ: I do want to emphasize a disclaimer, if you like, that while their advice was absolutely critical, they are not responsible for the recommendations and the findings. We have not asked for endorsement. We asked for their advice; we received it. But the results, then, are our responsibility. AMY GOODMAN: Later in the presentation, co-chair Anthony Meggs introduces the MIT report’s findings, saying environmental impacts associated with fracking are, quote, “challenging but manageable.” However, Meggs failed to disclose he had joined the gas company Talisman Energy prior to the release of the study. ANTHONY MEGGS: … messages are very simple. First of all, there’s a lot of gas in the world, at very modest cost. As you will see, gas is still, globally speaking, a very young industry with a bright future ahead of it. Secondly, and perhaps obviously at this stage, although not so obvious when we started three years ago, shale gas is transformative for the economy of the United States, North America, for the gas industry, in particular, and potentially on a global scale. Thirdly, the environmental impacts of shale development, widely discussed and hotly debated, are—and we use these words carefully—challenging but manageable. AMY GOODMAN: Kevin Connor, your response? KEVIN CONNOR: It’s absolutely outrageous for the Energy Initiative, for Moniz and MIT to pretend this is independent of industry, well, first of all, given the fact that the sponsors of the report are all, you know, industry organizations and companies like Chesapeake Energy. Moniz was attempting to say that it was somehow insulated from the influence of these gas companies, when in fact authors of the study, such as Moniz and Meggs, were—had industry positions at the time. Meggs’s quote there is particularly insidious, the fact that he is saying that fracking is safe for the environment, when he had actually joined Talisman Energy, a gas company, one of the most active frackers in the Marcellus Shale, a month before the study was released. So he is speaking to a roomful of journalists there, presenting a report designed to influence policy, and not disclosing that he is on the industry payroll. That is perhaps the last person in that room who should be presenting that finding or having anything to do with authoring that kind of report. And yet MIT and Moniz thought it was appropriate to put that spokesperson forward. So, it just goes to the fact that MIT was really sort of presenting an industry brochure here with a lot of pro-gas, industry advocacy talking points, and not revealing that there were significant conflicts of interest here. AMY GOODMAN: Justin Elliott, would you like to weigh in? JUSTIN ELLIOTT: Yeah, I mean, one thing to note is, Ernest Moniz is getting a confirmation hearing next month, and as part of that, he has to release a personal financial disclosure, and also, at some point later, he’ll have to—an ethics agreement will become public. So we should actually learn more about his current and recent involvement in these companies and possibly also stock holdings and that sort of thing, so it should be interesting. I think this story isn’t over yet. AMY GOODMAN: We’re going to break and come back to this discussion. Our guests are Justin Elliott—he’s a reporter with ProPublica—and Kevin Connor, who has put out a report on—from the Public Accountability Project called “Industry Partner or Industry Puppet? 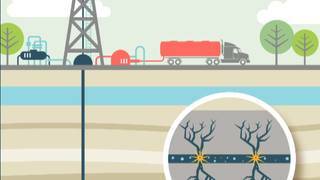 How MIT’s Influential Study of Fracking Was Authored, Funded, and Released by Oil and Gas Industry Insiders.” This is Democracy Now! We’ll be back in a minute. AMY GOODMAN: In October of 2009, Obama’s energy secretary nominee, Ernest Moniz, introduced Tony Hayward, CEO of BP, before he delivered a speech at the MIT Energy Initiative. This took place six months before the BP Deepwater Horizon spill in the Gulf of Mexico. ERNEST MONIZ: Tony, I think it’s fair to say, without getting into great details, faced a significant number of challenges at that time of transition and is, these days, getting quite good press, I might say, in terms of having the company operating well, producing and maintaining, I think, its stance, taken quite early, in terms of recognizing the need and acting on the need to address climate risk mitigation, for example, with its diversified portfolio. We are very pleased to have BP here as a member of the Energy Initiative—in fact, the founding—founding member of the MIT Energy Initiative. And in fact, as President Hockfield said just a few minutes ago to Tony, that that confidence shown in where we were going here at MIT, in terms of our focus on energy and environment, was very, very important, and we really appreciate that early support and the continuing relationship. In fact, many of you may know that besides the Energy Initiative, BP has a major presence in terms of a Projects Academy and Operations Academy with the Sloan School of Engineering. And in fact, I just heard, again, in the discussion a few moments ago, that 300 of BP’s 500 senior executives have, one way or another, interacted with MIT, so it’s really quite a substantial relationship. AMY GOODMAN: That’s energy secretary nominee Ernest Moniz speaking in October 2009, praising BP CEO Tony Hayward six months before the BP oil spill. Justin Elliott of ProPublica? JUSTIN ELLIOTT: I mean, one of the things that surprised me, actually, as I was researching this story, is the extent to which the MIT Energy Initiative is working with industry. I mean, it’s well known that they and other energy research projects get industry funding. But if you look at their annual reports and even their website, they say, if you give us money as a company, we will help you achieve specific business goals. So, I mean, in a lot of the coverage of Moniz, he has been presented as an academic, which he is, but in some ways I think the traditional categories are sort of failing us—sort of academic versus business executive. I mean, this really is a part of—I mean, it’s not formally part of BP, but they’re working as essentially a subcontractor for BP. So I think that’s really—and again, I mean, President Obama specifically praised Ernest Moniz’s ties with business when he introduced him. So, I mean, it’s up for interpretation whether or not these ties are a good thing, but I think that’s really the proper way to see his background and who he is. “frackademia,” gas-industry-funded academic research. In February of 2012, a year ago, University of Texas Professor Charles Groat published a study that suggested fracking did not lead to groundwater contamination. However, the study did not disclose Groat’s seat on the board of major Texas fracker Plains Exploration and Production Company, for which he was reportedly given $400,000 in 2011. That’s more than double his university salary. I want to go to a clip of Professor Groat explaining his study’s finding. CHARLES GROAT: The immediate concern with shale gas development and hydraulic fracturing was that fracturing at several thousand feet below the surface would put chemicals into groundwater that people drank that would be very bad for your health, and so people were very much opposed to hydraulic fracturing from that point of view. So, an important part of our study was to determine whether or not there is any direct, verified evidence that hydraulic fracturing itself was producing contaminated waters that ended up in that process in groundwater. Our preliminary finding is we have found no demonstrated evidence that that—demonstration that that has happened. KEVIN CONNOR: Well, as you noted, Groat, when he was saying this, had a serious stake in a gas company called PXP, $1.6 million stake, made several hundred thousand dollars a year, over $400,000 a year in 2011, and was going before the public and saying fracking is safe, without disclosing any of these related interests. I mean, there’s some question as to whether someone with that sort of stake in the industry should be working on this at all, but at the very least it should be disclosed to the public, to journalists. And because Groat didn’t disclose it, it resulted in a lot of blowback in Texas. The journalists were very concerned that Groat had not highlighted this for them when the report was released, and it resulted in quite a bit of media coverage. The University of Texas ended up commissioning an external review of the study, which concluded that the study should actually be retracted and noted that Groat’s conflict of interest was quite serious and should have been disclosed. So, the sorts of transgressions that we see at MIT have actually resulted in real accountability at other universities. Groat actually retired as a result of this episode. And the director of the Energy Institute at Texas, which is sort of an analog to MIT’s Energy Initiative—the director actually resigned in the wake of this external review. So there have been real consequences. There has been real pushback against this trend at other universities. And there’s some question as to whether that will happen with MIT. AMY GOODMAN: Well, going back to Moniz, because you’re talking about Groat here, not to be confused with the energy secretary nominee of President Obama, talk about what he makes at MIT, both as a university professor but also his outside funding. KEVIN CONNOR: I’m actually not sure of his salary at MIT. I don’t believe it’s publicly disclosed there, though it will be released in his financial disclosures. But as a board member at ICF International, which is an oil and gas—well, it’s a consulting firm with a significant energy practice and significant oil and gas ties—he’s made over $300,000 in the past two years since joining the board. This is a position where he attends several meetings a year. It’s certainly not a full-time position, and yet he’s making over $150,000 a year in stock and cash compensation. So these are not insignificant financial ties he has. AMY GOODMAN: And finally, Justin Elliott, Ernest Moniz is a nuclear physicist. Can you talk about the significance of that for energy policy, if he were to become the next energy secretary? JUSTIN ELLIOTT: Sure. I mean, actually, the Department of Energy, the majority of its budget goes to maintaining the nation’s nuclear weapons stockpile, and also they’re in charge of cleanup of old nuclear waste. He’s been a strong and public supporter of nuclear power. And that’s actually the area where some of these business ties get into areas of potential conflicts. As I mentioned earlier, he was previously on an advisory council of a uranium enrichment company called USEC, one of the—one of the largest, and they’ve been seeking a $2 billion loan guarantee from the Energy Department to build a centrifuge plant in Ohio. That’s been on hold for a few years while they look into it further. So, it will be interesting to see whether Moniz has to recuse himself from that or whether it gets mentioned in any of the congressional hearings, but that’s certainly one of the big areas the Energy Department is active in. JUSTIN ELLIOTT: Right. And again, I mean, I think this is in keeping with President Obama’s, quote, “all-of-the-above,” unquote, energy policy. I mean, this is—this is Obama nominating someone as energy secretary who is in keeping with the administration’s stated policy. AMY GOODMAN: President Obama has long been pro-nuclear power—in fact, is the one who is restarting nuclear power plants after, what, some 40 years of the last one being built. JUSTIN ELLIOTT: Right. And I think the only reason that effort has stalled is the price of natural gas, because of fracking, going down so low that nuclear power plants have become less economically feasible than they were five years ago. AMY GOODMAN: Final comments, Kevin Connor, as you release your report, director of Public Accountability Initiative, the report that you did called “Industry Partner or Industry Puppet?” has MIT responded? And were you able to speak with Professor Moniz? AMY GOODMAN: Central Intelligence Agency? KEVIN CONNOR: —basically had no response, just said that the authors aren’t biased, which is hard to believe, given these connections. AMY GOODMAN: Kevin, John Deutch, the former head of the Central Intelligence Agency? KEVIN CONNOR: Exactly. Former director of the CIA was actually a study author here and is on the board of the only company in the U.S. to receive permits to export LNG from the lower 48 states. And again, this study endorsed LNG exports on fairly—a fairly thin basis of evidence and didn’t disclose this connection, which is really, again, quite outrageous. AMY GOODMAN: Well, I want to leave it there; of course, we’ll continue to follow the nominee. The confirmation hearings will take place on April 9th. Justin Elliott, ProPublica reporter, and Kevin Connor, I want to thank you very much for being with us. Justin wrote “Drilling Deeper,” looking at “The Wealth of Business Connections for Obama’s Energy Pick.” And Kevin Connor wrote the study, “Industry Partner or Industry Puppet? How MIT’s Influential Study of Fracking Was Authored, Funded, and Released by Oil and Gas Industry Insiders.” We will link to it at democracynow.org. This is Democracy Now!, democracynow.org, The War and Peace Report. And when we come back, we’ll be joined by a well-known anchor here in New York, Cheryl Wills, who in this month of Women’s History Month—and we’ve just come out of African-American History Month—we’ll talk about what she found about her family. She wrote the book, Die Free: A Heroic Family Tale. Stay with us.